Justice Minister calls on President Rivlin to pardon former Prime Minister convicted of accepting bribes. Justice Minister Ayelet Shaked (Jewish Home) asked President Reuven Rivlin to consider granting a pardon to former Prime Minister Ehud Olmert. Olmert was convicted of one count of breach of trust over what was known as the "Investment Center" case in 2012. In 2014 he was convicted of two counts of bribery over the "Holyland affair." He was sentenced to six years in prison and fined 1.5 million shekels ($430,000). 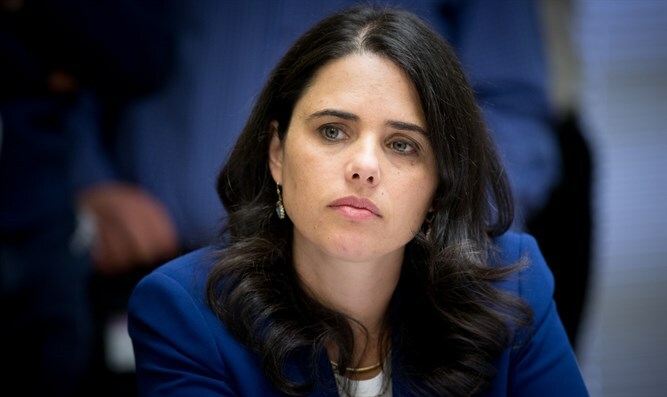 Shaked wrote to President Rivlin that she supports pardoning Olmert because of the former Prime Minister's "contributions to the security of the state." Shaked's position contrasts with that of the Justice Ministry, which has come out against pardoning Olmert. Olmert submitted his request for a pardon to President Rivlin in January. His lawyers stated in the request that the former Prime Minister "has suffered enough." In February, Coalition Chairman David Biton came out in favor of a pardon.